Congratulations to the winners of the Hajim School's 2013 Clothesline Arts Festival contest, held in cooperation with the Sage Art Center. 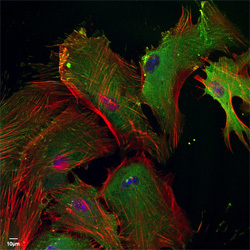 Contributors were encouraged to submit entries that examine the ways in which art, science, and technology "imaginatively intersect and innovatively influence our world." First prize received $300, second prize was an Apple Ipod Touch, and third prize was $100. These winning entries will be on display at our tent Sept. 7-8 at Rochester's premier fine arts and craft showcase, which is held each year on the grounds of the Memorial Art Gallery. Currently working at Exelis Inc. in Rochester. "The Big Day probably represents the largest chunk of time I've ever spent on a single physical project. Intended as a gift to my grandpa, The Big Day is inspired by the trips my grandpa and I took to Kennedy Space Center when I was in middle school. 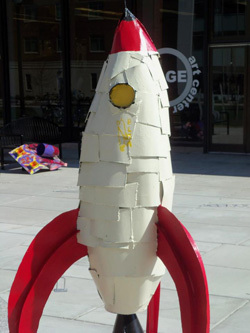 "The rocket is made entirely out of welded sheet steel. The original form was created using CAD modeling, and this provided the diameter at various heights. Once the free form was perfected in Pro/Engineer, I took the dimensions, and made hoops of the proper diameter. These hoops were welded to sheet metal strips to form a "skeleton" (picture attached). Once this skeleton was formed, freely cut fins were welded on. Once all this was complete, small plates of steel were hand bent and welded to the rocket to form a "scaled" skin. Finally the whole sculpture was cleaned, primed, and painted." "Electronics are suffering from shorter and shorter lifespans, and stockpiles of abandoned devices destined for the landfill are accumulating at an alarming rate. 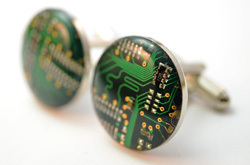 In an effort to cut down on this e-waste, the often overlooked design of circuit boards is used to create functional accessories, like cufflinks, that have a much longer lifespan. By using a circuit board as the focus of a product, rather than its function, wearers gain an appreciation for both the impact of technology on society, as well as its beauty."